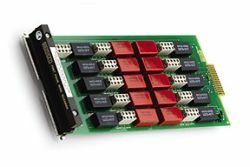 Four-wire or Kelvin connections are generally made to minimize errors created by I-R drops in the cabling and interconnects of a test system. Each channel of the Model 7067 has two generalpurpose source contacts that switch currents up to 350mA, as well as two high quality contacts (<1μV contact potential) for dry switching of voltage to the sensing circuit. The Model 7067 is well-suited to precision resistance measurements as required in temperature coefficient testing. Other applications include remote sensing of voltage source outputs and bridge measurements.